The parishes of Rendham and Sweffling are separated by the infant River Alde. Both are pretty villages, although Rendham suffers slightly from the traffic of the main Framlingham to Saxmundham road which bisects it. The two churches are not far from each other, and have some similarities. St Michael sits at a ninety degree bend in the main road, giving it a large presence in its wide graveyard, and also suggesting that the route of the road is as ancient as the site. The church looks very like its sister across the river, having a 14th century tower and a 15th century porch. Unlike Sweffling church, which is approached up a wide hill, here there is just a short path from the road, overshadowed by thick-set trees. St Michael is one of those pleasing, welcoming churches in the Framlingham area which make church-visiting such a pleasure. With one important exception, the interior is almost entirely the result of a Laudian-inspired refurbishment in the early decades of the 17th century, and a major makeover in Victorian days. But the one major medieval survival is a chalice brass, one of only two in the whole of Suffolk. The other is way across the county at Gazeley. It is a perfect, jewel-like thing, set into the centre of the nave. It can be dated to 1523 by its inscription: Here lyeth Thomas Kyng sutyme vicar of this churche who died XXVI daye Aprile ADo MCCCCCXXIII. Chalice brasses were a conventional way of memorialising members of the clergy in late medieval times. How did it survive? Well, the inscription doesn't include any invocation for prayers for the soul of the dead, and so wouldn't have incurred the wrath of 16th and 17th century vandals and iconoclasts. They may not have understood the sacramentalist significance of the chalice, and simply thought it too small to be worth lifting and melting down. Amen to that. As at Sweffling, there is a small local history museum at the back of the church. I remember visiting some ten years ago, and talking to the lady who was rearranging the cabinets. She told me that there was still great rivalry between the two villages, and occasionally a little ill-feeling. When I raised my eyebrows, she explained that this stemmed back to the Civil War. 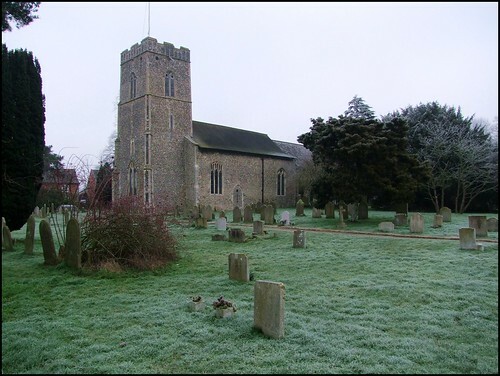 Sweffling was parliamentarian, but Rendham, unusually for Suffolk, supported the King. She felt that you could still sense this difference in the two churches, and it is certainly true that Rendham was richly furnished by successive waves of anti-puritan sentiment. The Laudians gave it the pulpit, dated 1632, and it is one of Suffolk's best of its type - perhaps only Dallinghoo's is grander. Mortlock thinks that the east window was also reconstructed at this time. It is now filled with fairly decent early 20th century glass. Otherwise, almost everything is squeaky-Victorian-clean, but don't miss the canvas Charles II arms on the south wall, which we may assume the parishioners installed with both enthusiasm and relief; and perhaps a little triumph as well, for instead of the usual Latin it reads simply God Save The King. Visitors to the Roman section of the British Museum will have seen the ghostly head of the Emperor Claudius, which may originally have come from the Temple of Claudius at Camulodonum. There are replicas in the museums at Ipswich and Colchester, and there is another one here. The head was fished out of the river here at Rendham, just to the south of the church, and part of the museum records its discovery in photographs and newspaper cuttings from the time. It hadn't been there when I'd visited before: the lady in charge on that occasion had told me about plans for the replica, but also said that she thought this was a terrible idea. "He was an awful man", she said. "He killed so many Christians. It wouldn't be at all appropriate." As school children, we were told that the head was removed by the Iceni hoards who attacked Camulodonum with Boudicca in AD87, and used as a football as they headed home in the triumph of victory, to their camps in Norfolk. (I always doubted this, guessing that a head made of bronze would be even harder than the old leather balls they made us use in PE). Anyway, at Rendham, the ball went in the river. That's what we were told, anyway.